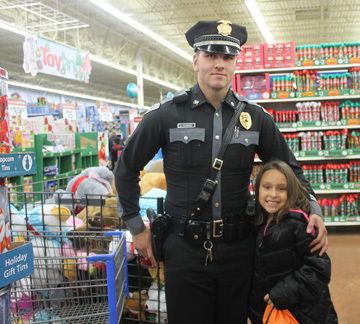 Above, Officer Edgar Palomarez of the New Mexico State Police and Dianna Sanchez pause for a picture while shopping in the Christmas aisle Saturday evening at Wal-Mart during the annual Shop with a Hero event. 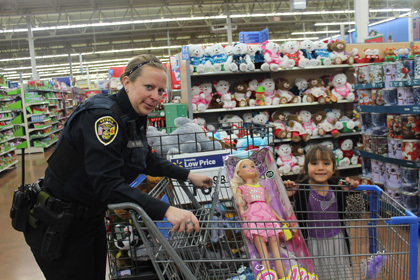 At right, Officer Beth Hahn of the Artesia Police Department and Jahira Sepulveda shop for a baby doll during the event, through which children are paired with law enforcement and public safety officers and agents and given $100 gift cards to spend as they choose. 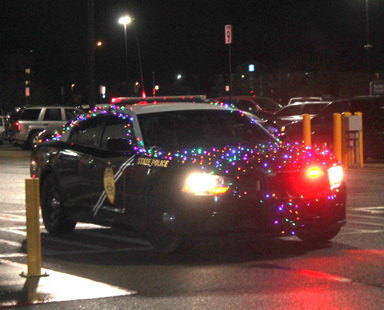 Below, a New Mexico State Police vehicle decked out in festive lights leads the Shop with a Hero parade from Park Junior High School to Wal-Mart.